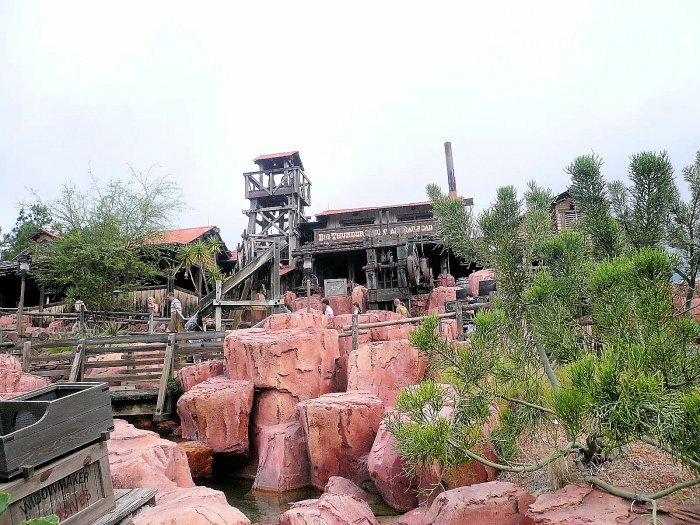 This article gives an overview on the Big Thunder Mountain Railroad queue or line for the attraction at Walt Disney World Resort’s Magic Kingdom in Bay Lake, Florida or the Orlando area. The ride is located in the Frontierland Section of the theme park. The Big Thunder Mountain Railroad line or queue, depending on what region you are from, is starts at the base of the ride in Frontierland. The attraction is located near Splash Mountain and the Walt Disney World Railroad station for Frontierland. When approaching Splash Mountain from Liberty Square, you turn right at the end of the walkway and Big Thunder Mountain Railroad queue entrance is straight ahead. The line itself takes you from the bottom of the mountain into the offices of Big Thunder Mountain Railroad. There are two lines as Big Thunder Mountain Railroad, sometimes called BTMRR, is a FastPass+ ride. One line is the stand-by line and the other line is the FastPass line (now the FastPass+ line). Once you enter the open air building, you make your way to the ride through a series of turns through the themed Big Thunder Mountain Railroad building. The building has various exhibits of and some interactive items. The interactive items include dynamite plungers. Music also plays in the line, which is themed to the gold rush era. After navigating through the turns, you will head downward to the loading area. At the entrance of the downward portion, a cast member will be there to allow guests in the FastPass+ line enter the main queue. The cast member will stop the main line to allow FastPass+ guests enter the queue. After this portion there is a split that for each side of the train station or loading area. Here you get the choose which side to take. After choosing one side of the line, you then head down to the loading area, which is below the top portion of the queue. The boarding area uses the gate style boarding system that can be found on other rides at Walt Disney World. There can be up to 2 people per gate as the train can fit up to two people per row. When the train arrives in the station you the gates will open to allow you to board the ride/train. A video of the queue from YouTube is provided below. It is the first video from our Big Thunder Mountain Railroad playlist. You can also view more videos of the attraction on our upcoming video page. To learn more about Big Thunder Mountain Railroad, please visit the other pages about the ride.